Starting the year at NBCS: Putting the F.U.N in PD to build a positive culture of collaboration and connection. 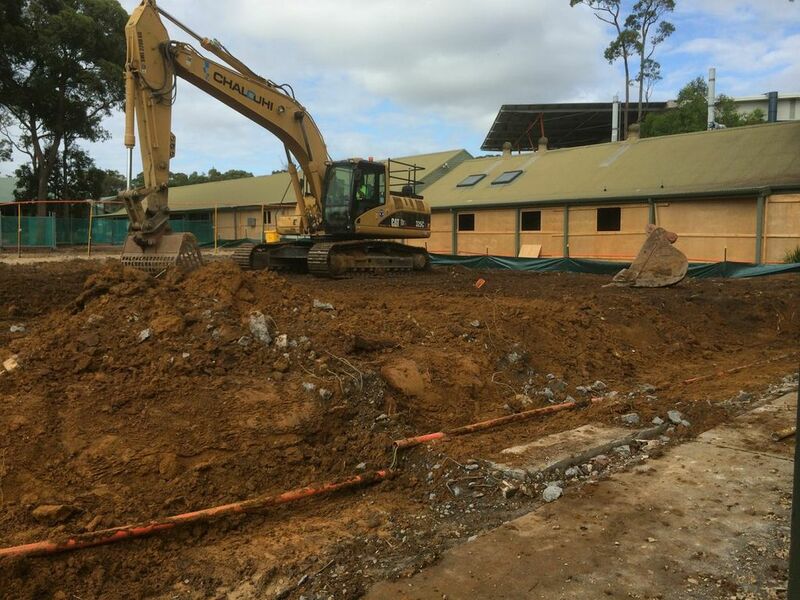 At the end of 2013, as the school year was finishing, the construction (and demolition) crews were coming into NBCS. Project Barcelona, the much awaited development of transforming the physical space of ‘school’ into a whole new model was underway. The brief that principal Stephen Harris gave to the architect was to create a new heart of the school that provided a space for learning, connection and social interaction. 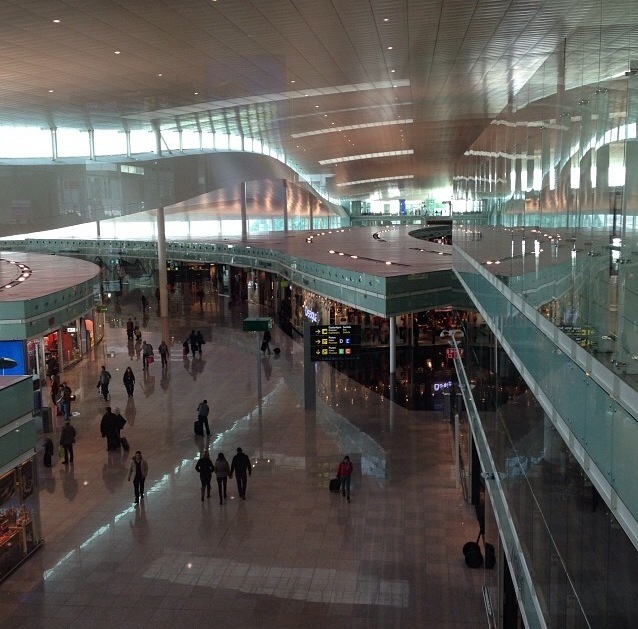 The inspiration came from Barcelona Airport, with its large canopy overarching the activity within. Under these conditions it is essential that staff commence the year with a positive frame of mind and then model and reinforce this to their students. It was going to be a challenging year and a half, but the outcome will be worth it. What are the challenges facing the school’s community? The hoarding erected around the perimeter of the site creates an inner ring of corridors, interspersed with viewing windows. There are only two ways to get around from one side of the school to the other… the long way or the long way. Stephen Harris devised a series of collaborative activities that would build community, get people working together, know their way around the school, make a contribution to enhancing the physical environment, tackle the pressing issues and, most importantly, have fun. Day 3: All staff together. This process began with the SLT. Stephen led the tour around the school, making note of toilet changes, learning space changes and the impact that these will have on the leadership of the school. And then the fun began. The day before, he had created the first mural to brighten up the hoarding. It was an outline of himself. Then the SLT were placed in groups to devise a pitch that would build on this lonely figure to create something fun. Each group were to pitch their idea, Dragons Den style to the others. When the project was selected the SLT become the project team to make it a reality. 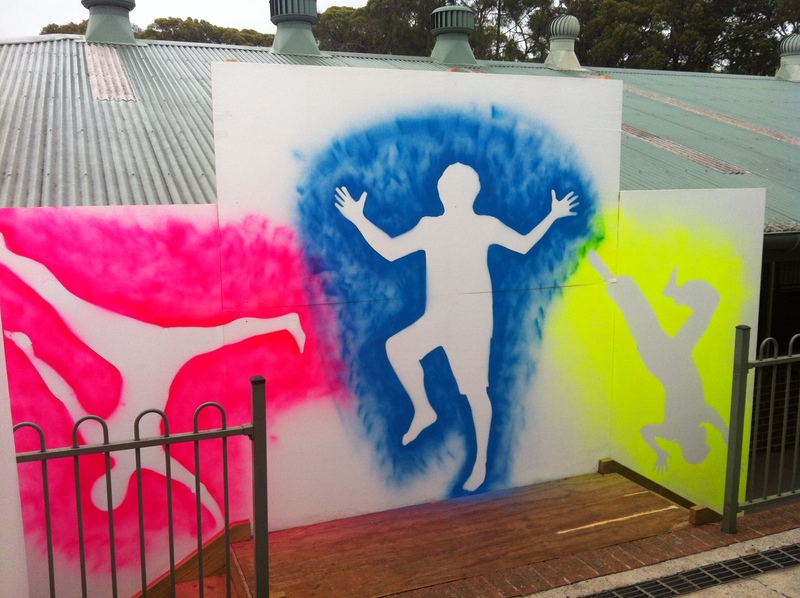 This activity set the tone for creating a mural along the hoarding, but also put the SLT together within a collaborative project, working together on assigned roles and owning the outcome. When SET arrived the next day the culture of fun and collaboration was underway. This larger group, together with SLT, about 40 people was set a different challenge for collaboration. Stephen presented a moderate budgetary allowance, to fund a way to encourage staff and build morale. Using the Dragon’s Den method of pitching an idea, combined with the Athenian method of casting votes with broken pieces of a clay pot, each group set to work. 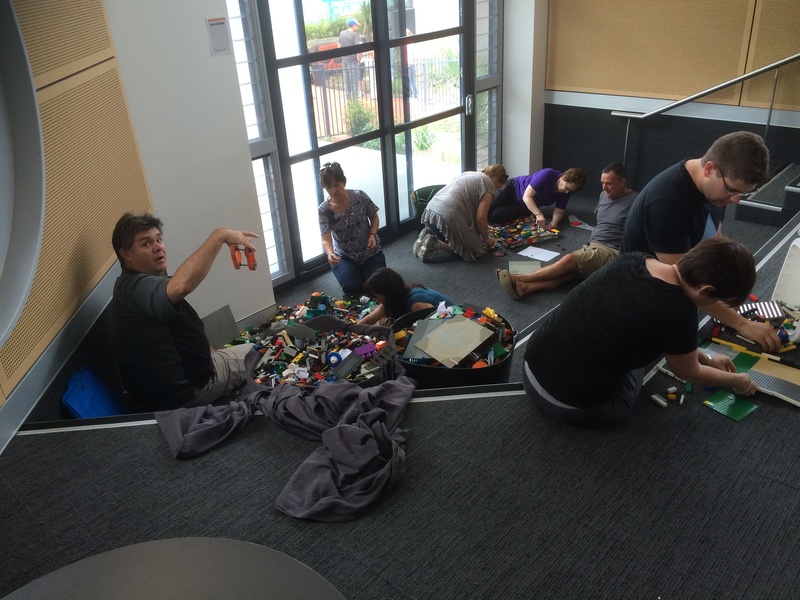 The composition of the groups were random, an important element of building community across the school. The winning group’s idea was selected after the old pots were smashed and each of us voted using a piece of clay. 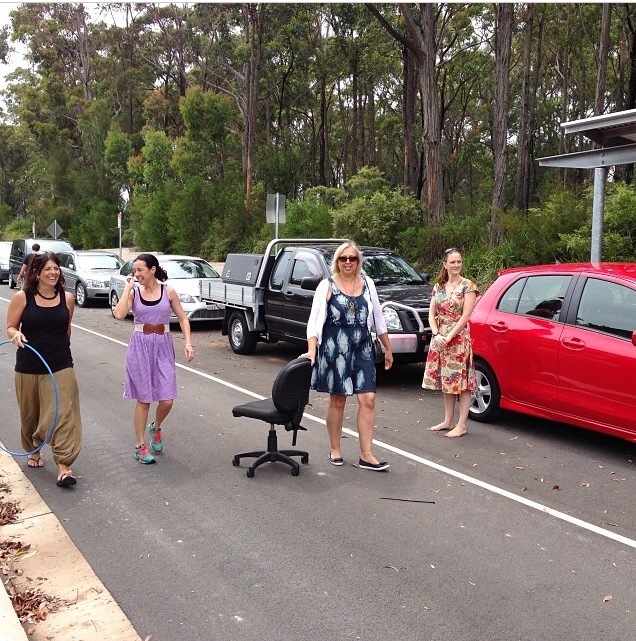 Physical challenge: determine the fastest way your team can go on a lap of the short stay car park. Timed as a relay circuit. The creativity that came out of the activity was amazing. 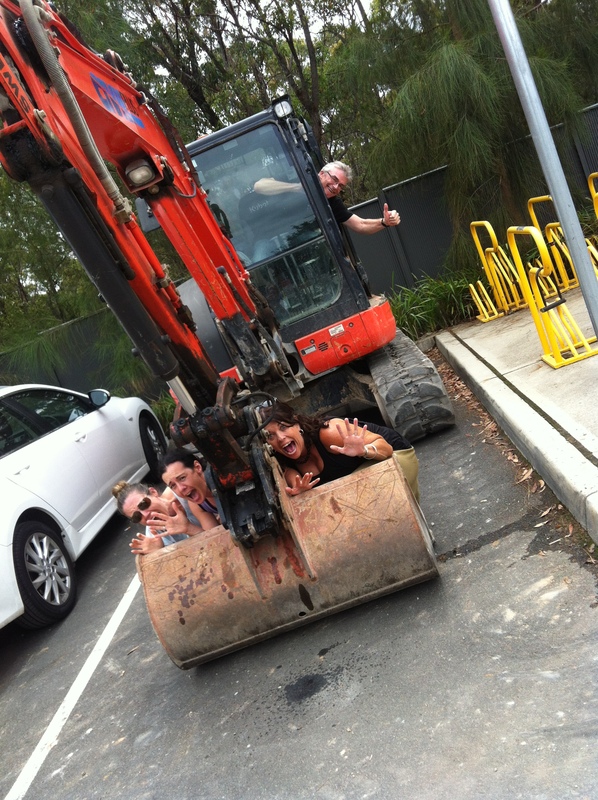 The fun laughter and energy around the school was contagious, as people gathered art materials, film props, snuck into construction vehicles for photos and raced around the carpark. Along the way people learn new skills from their colleagues. The initial outcomes were definitely achieved, but the greatest outcome was an incredible sense of community and connection amongst the staff. The newest teachers immediately felt like part of the community and we all had new and shared experiences that we could laugh about. In addition to these, there were team-based activities directly related to the work for the year. Once the students arrived there was an atmosphere of excitement for what lay ahead. How did the staff at your school year start? How are you reinforcing your culture of community and collaboration? Wonderful update on the construction phase and the collaborative activity for your staff and SLT! Fantastic way to reinforce the culture of community and collaboration!